We all love the benefits of technology and social media, but even with the incredible upsides, many of us suspect there are unintended negative consequences beyond our control. The more we compare ourselves with others, the less satisfied we are. The more we interact online, the more we crave face-to-face intimacy. The more filtered our lives become, the more challenging it is for us to be authent… ic. The more information we receive about the pain and crises in the world, the more difficult it is for us to care.In this timely five-session video-based study (DVD/digital video sold separately), New York Times bestselling author Craig Groeschel taps in to some of the most up-to-date studies on social media to help us understand how it affects our emotions, our relationships, our attitudes, and our beliefs. 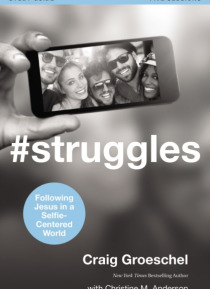 He offers real-life examples to reveal the depths to which each of us battles with social media, how it masks our real struggles, and how we can reclaim a Christ-centered life. He encourages us to regain control over our lives by rediscovering the principles real life with Jesus brings: contentment, intimacy, authenticity, compassion, and rest.#Struggles will show you the ways technology has enslaved you rather than served you and what changes your need to make in your life to restore balance. Above all, it will point you to Christ and help you understand the healing he wants to do in you. As you follow his leading and seek him first, you will find you are no longer defined by who follows you but by the One you follow.Sessions include:Recovering Contentment (10:00)Restoring Intimacy (10:00)Revealing Authenticity (10:00)Resurrecting Compassion (10:00)Replenishing Rest (10:00)Designed for use with #Struggles Video Guide (sold separately).